Hawke's Bay is situated on the east coast of the North Island. 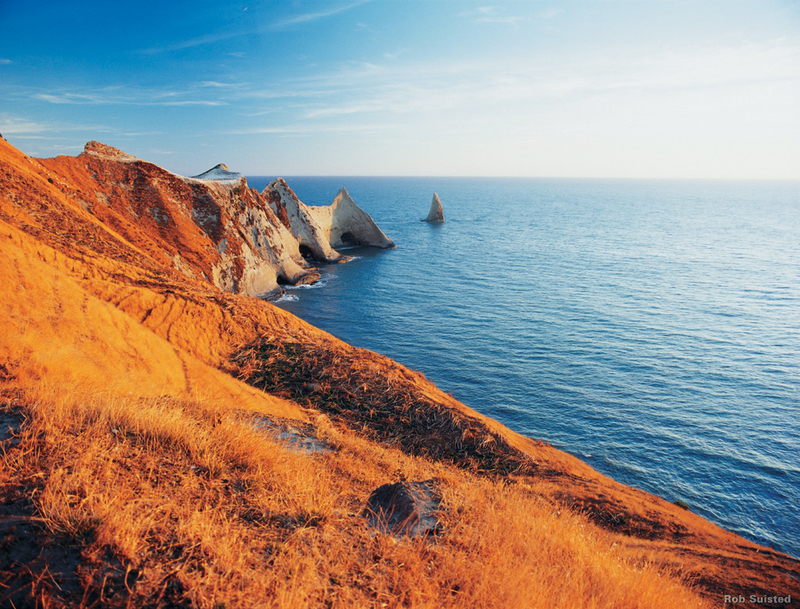 The region bears the former name of what is now Hawke Bay, a large semi-circular bay which extends for 100 kilometres from northeast to southwest from the Mahia Peninsula to Cape Kidnappers. The Hawke's Bay region includes the hilly coastal land around the northern and central bay, the floodplains of the Wairoa River in the north, the wide fertile Heretaunga Plains around Hastings in the south, and a mountainous interior atretching up to the Kaweka and Ruahine Ranges. The region's boundaries vary somewhat from the former provincial boundaries of Hawke's Bay, and some towns in the Manawatu-Wanganui Region to the southwest, such as Dannevirke and Woodville regard themselves as still part of the Hawke's Bay. The region consists of Wairoa District, Hastings District, Napier City, and Central Hawke's Bay District as well as a small part of Taupo District. The main urban areas are Napier and Hastings. Smaller communities include Wairoa, Taradale, Havelock North, Tikokino, Waipawa, Waipukurau, and Takapau. The climate is dry and temperate. 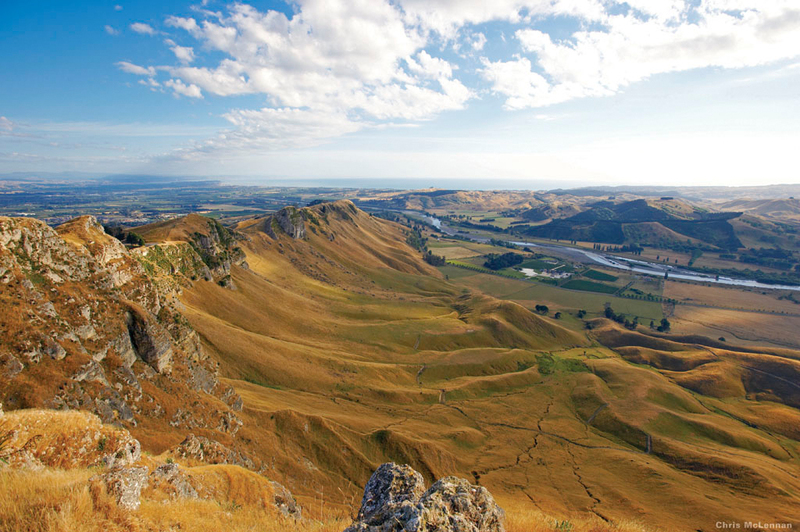 Hawke's Bay is renowned for its horticulture with large orchards and vineyards on the plains. In the hilly parts of the region sheep and cattle farming predominates, with forestry blocks in the roughest areas. Cape Kidnappers is a headland at the southwestern extremity of Hawke Bay on the east coast of New Zealand's North Island. It is located 20 kilometres southeast of the city of Napier. The promontory sits at the end of a eight kilometre long peninsula which protrudes into the Pacific Ocean. It was named after an attempt by local Maori to abduct one of the crew of Capt. James Cook's ship Endeavour in 1769. The Cape is the site of a large gannet colony. Gannets, members of the booby family, are usually island breeders but have made a exception at Cape Kidnappers. Adult Australasian gannets have a wing span of up to two metres and weigh around two kilograms. Whilst ungainly on land, gannets are graceful in flight and spectacular when diving into the sea to catch fish. The small town of Clive is located ten kilometres south of Napier in the Hawke's Bay region of New Zealand's North Island. It is close to the mouth of the Ngaruroro River. Hastings is a large urban area in Hawke's Bay, close to the east coast of the North Island of New Zealand. Less than 15 kilometres separates the centres of Hastings and Napier, and as such the two are regarded as twin cities. In local government terms, however, the two are considerably different. Where Napier is a city, Hastings' city status was lost in 1989 when it was amalgamated with Havelock North, Flaxmere and a rural hinterland to form the Hastings District. Ironically, this has left Hastings with the larger population of the two centres. Founded in the 1850s, early names for Hastings included Hicksville, after a prominent local settler, and Heretaunga. In keeping with other local towns (such as Napier and Clive) its name was later changed to that of a prominent statesman or soldier from Imperial India - in this case, Warren Hastings, the first Governor-General of India. Hastings was badly damaged by the Napier earthquake of February 3, 1931, which destroyed or damaged almost every building in the town. Situated on the Heretaunga Plains, Hastings is flat with no natural landmarks. The local area is very productive, with orchards and vineyards surrounding the city. The main industries are agricultural, with freezing works and canneries being major local employers. Honey is also a well known local product. Hastings has a sunny climate, but due to its lack of landmarks and proximity to the more picturesque Napier, it is much less of a tourist destination. Wairoa is a town in New Zealand's North Island. It is the northernmost town in the Hawke's Bay region, and is located on the northern shore of Hawke Bay at the mouth of the Wairoa River and to the west of Mahia Peninsula. It is 70 kilometres northeast of Napier, and a similar distance southwest of Gisborne. Early settlement in the area included a whaling station and trading post, dealing largely in flax. Its initial name was Clyde, but this was changed largely to avoid confusion with Clive near Napier and Clyde in the South Island. The town rose to prominence during the Maori Wars, during which time it was a garrison town. Today, the town is a manufacturing and farming service town. It is the seat of the Wairoa District Council. The Wairoa District covers the northern half of the bay's coast, and extends from Mahia Peninsula to Lake Waikaremoana, and south to the mouth of the Waikari River.